Angular Contact Spherical Plain Bearing GE.SW Series are available with different sliding contact surface combinations, where the sliding surfaces of inner and outer rings are made from different materials. A full range of thrust and angular contact spherical plain bearings are available both in inch size and metric size. The sliding contact surfaces of Angular Contact Spherical Plain Bearings are spherical in shape and inclined at an angle to the bearing axis. 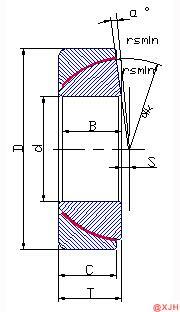 Consequently, these bearings are well suited for accommodating combined (radial and axial) loads. These bearings can be separated, enabling the rings to be mounted separately. We are successfully meeting the varied requirements of our clients by providing the best quality range of Angular Contact Spherical Plain Bearing GE.SW Series. Moreover, our product is available at cost effective prices. Our entire product range acclaimed among the clients for durable standards and has high quality. Outer ring of carbon chromium steel,hardened, with sliding surface of PTEF fabric;Inner ring of carbon chromium steel, hardened, sliding surface hard chromium plated. It has characteristics of maintenance-free, Wear-resistance, self-aligning and lower friction, suitable for radial loads and single direction axial loads mechanism.